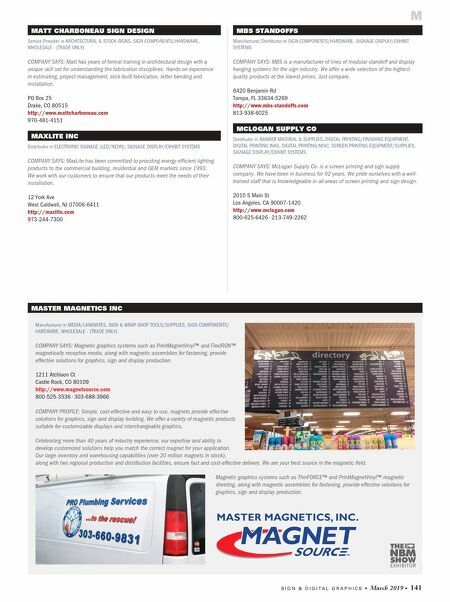 S I G N & D I G I T A L G R A P H I C S • March 2019 • 141 MBS STANDOFFS Manufacturer/Distributor in SIGN COMPONENTS/HARDWARE, SIGNAGE DISPLAY/EXHIBIT SYSTEMS COMPANY SAYS: MBS is a manufacturer of lines of modular standoff and display hanging systems for the sign industry. We offer a wide selection of the highest- quality products at the lowest prices. Just compare. 6420 Benjamin Rd Tampa, FL 33634-5269 http://www.mbs-standoffs.com 813-938-6025 MCLOGAN SUPPLY CO Distributor in BANNER MATERIAL & SUPPLIES, DIGITAL PRINTING/FINISHING EQUIPMENT, DIGITAL PRINTING INKS, DIGITAL PRINTING MISC, SCREEN PRINTING EQUIPMENT/SUPPLIES, SIGNAGE DISPLAY/EXHIBIT SYSTEMS COMPANY SAYS: McLogan Supply Co. is a screen printing and sign supply company. We have been in business for 92 years. We pride ourselves with a well- trained staff that is knowledgeable in all areas of screen printing and sign design. 2010 S Main St Los Angeles, CA 90007-1420 http://www.mclogan.com 800-625-6426 • 213-749-2262 MATT CHARBONEAU SIGN DESIGN Service Provider in ARCHITECTURAL & STOCK SIGNS, SIGN COMPONENTS/HARDWARE, WHOLESALE - (TRADE ONLY) COMPANY SAYS: Matt has years of formal training in architectural design with a unique skill set for understanding the fabrication disciplines. Hands-on experience in estimating, project management, stick-built fabrication, letter bending and installation. PO Box 25 Drake, CO 80515 http://www.mattcharboneau.com 970-481-4151 MAXLITE INC Distributor in ELECTRONIC SIGNAGE (LED/NEON), SIGNAGE DISPLAY/EXHIBIT SYSTEMS COMPANY SAYS: MaxLite has been committed to providing energy-efficient lighting products to the commercial building, residential and OEM markets since 1993. We work with our customers to ensure that our products meet the needs of their installation. 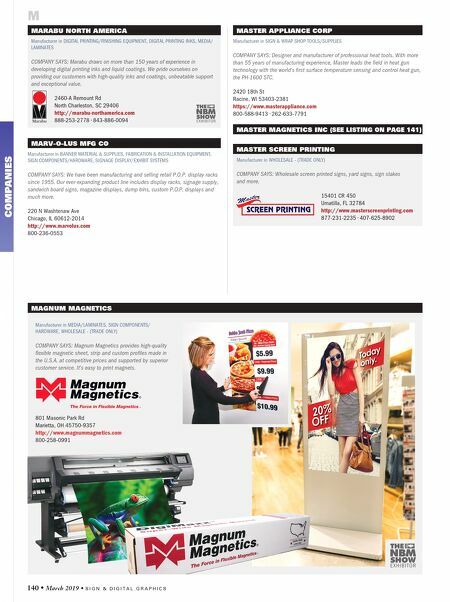 12 York Ave West Caldwell, NJ 07006-6411 http://maxlite.com 973-244-7300 M MASTER MAGNETICS INC Manufacturer in MEDIA/LAMINATES, SIGN & WRAP SHOP TOOLS/SUPPLIES, SIGN COMPONENTS/ HARDWARE, WHOLESALE - (TRADE ONLY) COMPANY SAYS: Magnetic graphics systems such as PrintMagnetVinyl™ and FlexIRON™ magnetically receptive media, along with magnetic assemblies for fastening, provide effective solutions for graphics, sign and display production. 1211 Atchison Ct Castle Rock, CO 80109 http://www.magnetsource.com 800-525-3536 • 303-688-3966 COMPANY PROFILE: Simple, cost-effective and easy to use, magnets provide effective solutions for graphics, sign and display building. We offer a variety of magnetic products suitable for customizable displays and interchangeable graphics. Celebrating more than 40 years of industry experience, our expertise and ability to develop customized solutions help you match the correct magnet for your application. Our large inventory and warehousing capabilities (over 20 million magnets in stock), along with two regional production and distribution facilities, ensure fast and cost-effective delivery. We are your best source in the magnetic field. Magnetic graphics systems such as ThinFORCE™ and PrintMagnetVinyl™ magnetic sheeting, along with magnetic assemblies for fastening, provide effective solutions for graphics, sign and display production.